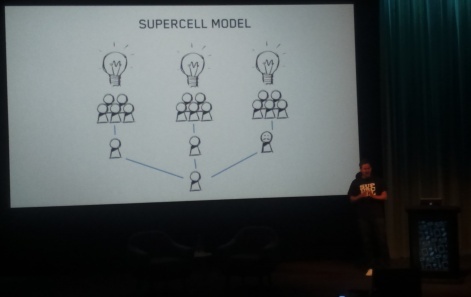 Supercell looking at ways to bring its company culture to "teams in other locations"
Supercell CEO Ilkka Paananen's recent BAFTA games lecture was packed full of insight into the Helsinki company and its unique company culture. However, as hinted in his conclusion to the lecture, Paananen doesn't want the Supercell company culture to remain quite so exclusive. "The bottleneck here is not everybody, unfortunately, wants to move to Helsinki," he said, explaining the difficulty in meaningful expansion for a company as discerning as Supercell. Indeed, elsewhere in the talk it was revealed that the firm hired only six developers in 2015 - an average of one hire every two months. "So right now, what we are thinking about very actively and [are] very interested about is to look for other teams in other locations who would be interested in joining this type of environment," he went on. "Obviously, since we are able to make this work internally and we don’t really mess with the teams, we believe that we can also make it work with external teams." So, what exactly does this mean? It doesn't seem as though Paananen is talking about building international studios from scratch, so could he be teasing future studio acquisitions? The phrasing is ambiguous, but this is certainly a reasonable assumption to make. But whatever Paananen has planned, it's not something the studio is planning on rushing into. "We feel we could take this forward at some point, when we find the right teams," he said. You can read our round-up of 5 things we learned at Ilkka Paananen's BAFTA Games Lecture here.